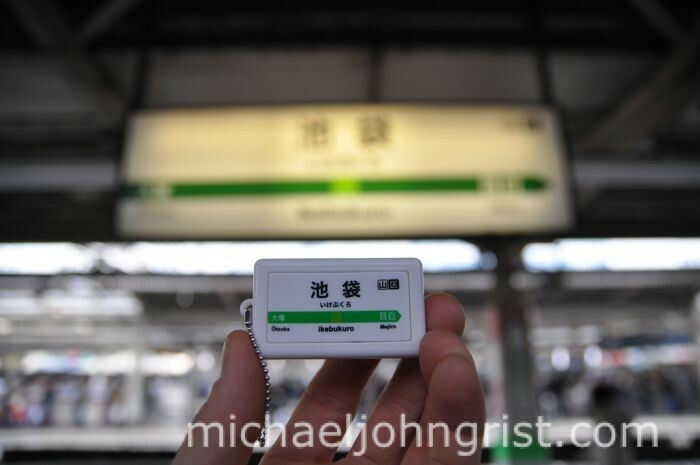 Train Stations in Japan have jingles; at least the stations on the JR Yamanote line do- when the trains pull in and when they pull out. They’re bright, cheery, and last about 10 seconds. I suppose they let us know- OK, now it’s time to get on the train. Now it’s time to get off. Oops, mind the gap! Each train station has a different jingle – Buddha alone knows why, perhaps so the blind know where they are – but now an enterprising toy-maker has produced a range of collectible key-chains that burble out the full range. Who needs Pokemon? Ikebukuro Jingle Key-Chain, at Ikebukuro Station. I found these chaps at a store at the end of Ginza, a whole rack of all the stations on the loop in miniature. I live in Mejiro, but couldn’t easily find one for that, so just went with Ikebukuro- which is bigger and I also live there anyway. 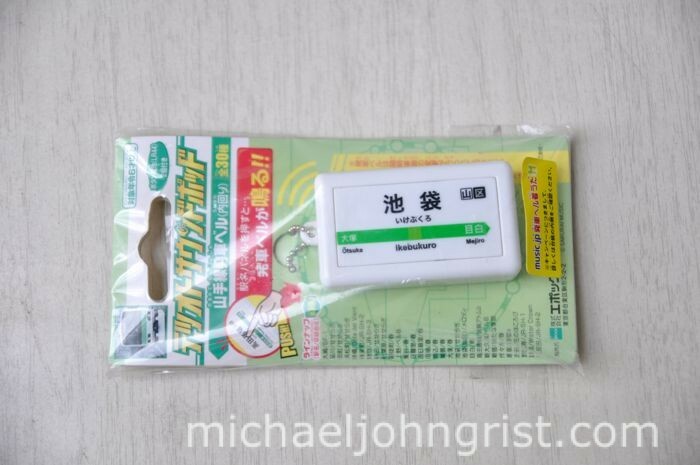 It cost about 500 yen and there is no chance I will use it as a key-chain- the jingle button is hyper-sensitive and would be going off all the time. Embarrassing! I’m going to try something different with this toy- a kind of tombola competition. I want links to my website- because that makes my website awesome and upticks my Technorati and Pagerank authority. What do I need that for? Ha, I don’t know! Anyway- bloggers want links back to their blogs. And people, maybe, want this super-awesome jingle key-chain. The key-chain, or the actual station? I can’t tell. So, here’s what to do if you want this key-chain, and also the next 3 toys / games products I feature on this site, over the next month. Link to my site from your site. Sorry, forums and sidebars don’t count, it has to be in the main body. Then comment on this post, with the link to your site linking to me- so I can check. We both get links. You’re in with a chance to win awesome J-goodies! At the end of March I’ll draw a winner (by checking your link in the comments) and send, yes by post, the gear to the chosen winner. Rock on? 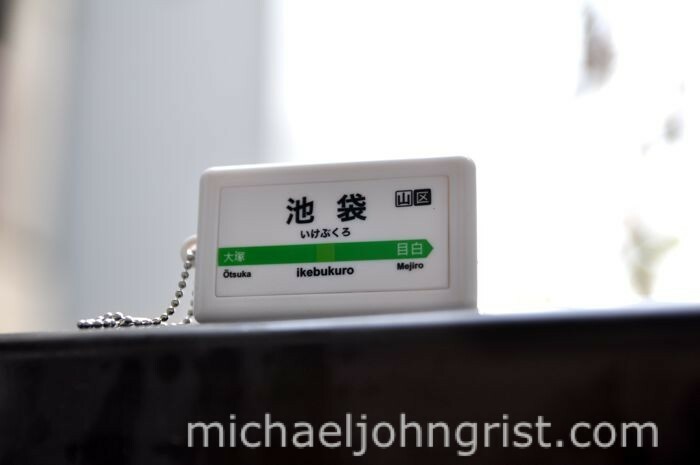 Ikebukuro Keychain Jingle from Michael John Grist on Vimeo. 1- Link to me on your blog (not forum or sidebar). 2- Comment on this post or one of next 4, including link to your site with link to me. 3- Sit back and wait for the goodies to roll on in! I think the station melodies actually have an additional function besides being useful for the blind. My theory is that they are also useful for long-time commuters in Japan, who, if you have noticed, tend to fall asleep on the train. If they memorise the melody of their station, they’ll know when to get up and get off. Of course, bad luck if you are so deeply asleep that you didn’t hear the music. On another note, I find many things about Japan to be friendly to blind people. The dedicated chirping buttons on the road crossings, for example, which both allow the blind to find them, and also has a function (I’m not sure what, possibly to lengthen the duration of the green man?). We used to refer to these station jingles as “Happy Hurry-Up Music”. I must say your narration of the post amused me greatly Michael! Gimme, gimme, gimme, gimme! Ha. I like your honesty Michael. That,s cool. I love those station jingles. Gristy! I’ve been reading your blog for a while and genuinely love it. I spent 2002 in Hitachi and I still think of Japan really fondly. I’d completely forgotten about the train jingles. Hope all is well, keep up the good work. Ah! I remember the ikebukuro jingle haha. 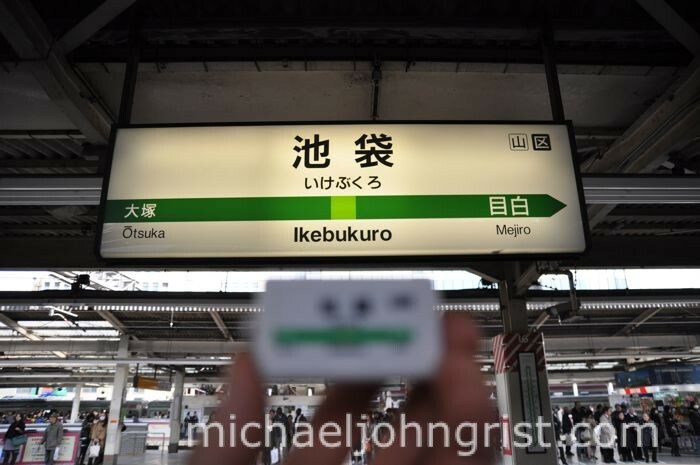 Ikebukuro is my favorite station. 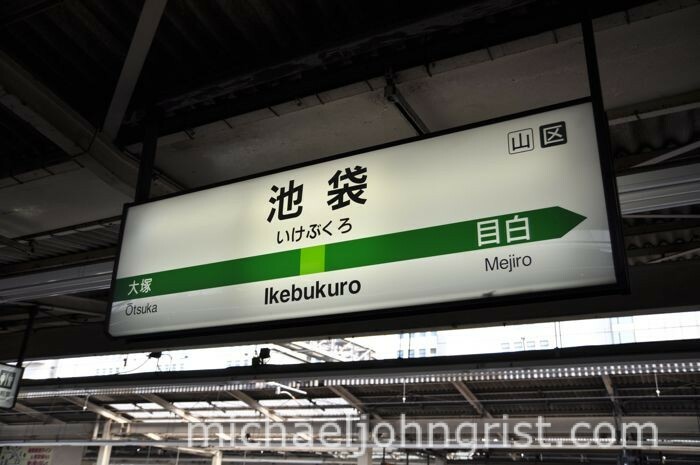 I stay in Ikebukuro a few times a year and have just blogged about it. Have you seen the Engrish photo from Ikebukuro station? I posted that on my blog along with your site! Looking forward to the possibility of showing off a key chain to my friends! 🙂 Thanks! I don’t know if you received or wrote back to my earlier email, since I was having some trouble with my mail server, but I’ve got it fixed and working now. Great comments everyone, thanks a lot- great response and my Technorati is up to 43! Thank you all. Just to be clear- to be certain of entry into the competition- it’s best if you link to your link here- or I have to go searching to find it. To anyone as yet un-entered- there’s still plenty of time, and I’ll be adding 3 more prizes to the booty. Icie- Good call, it could help the drunk. Once I was in a scavenger hunt where memorizing the jingle from a certain station was one of the tasks. As for helping the blind- definitely, this country makes a larger effort than most I think. The bobbled yellow trails through train stations, braille maps, chimes at walkways- it’s all very forward-thinking. Headbang- They certainly are cheery. Neil- Thanks, and thanks also for putting it in your news feed, I got a few hits from that- cheers! Jordan- Now I can even more honest, as I know why I need links- the site is (a little) monetized now, with Google Ads. I swore I never would! Jamaipanese- Definitely, or you could win one in this tombola! Rick- Hey, good to hear from you. That’s great you like the blog, thanks for letting me know. Hitachi- working? How was that? All’s well here- hope the same with you. Chris- Hey, I saw your blog- I don’t think I’ve ever seen that Engrish but it’s definitely a good one. Until I moved here I quite disliked Ikebukuro- it seemed so pointless, empty, and tacky. But now I know it, can walk to it easily, and feel quite at home.Good luck with the draw! Ian- Hey, I think I got the email but got it muddled in my junk mail filters- I’ll dig it out if I can and reply- sorry. Thanks for the comment though, and good luck in the draw! I drew names from a hat, and came up with- Chris Haul! Chris I’ll fire you off an email, if you let me know your address I’ll send the jingle key-chain plus some additional bits and pieces tout de suite. Thanks everyone for playing- sorry you couldn’t all win! Hey Mike I just got back from Tokyo a few hours ago, literally. I bought one of those key chains (the shimbahi one) and though I did go through that statation to get to Odaiba I stayed in Shinagawa. So I wanted that key chain and the ones from Shibuya and Shinjuku. Anything we can work out since I wont be back there for at least another year? You have my email so let me know.